I first say the drawings in this book a year a go, in the home of a man names Peter Wenders. Though Mr. Wenders is retired now, he once worked for a children's book publisher, choosing the stories and pictures that would be turned into book. 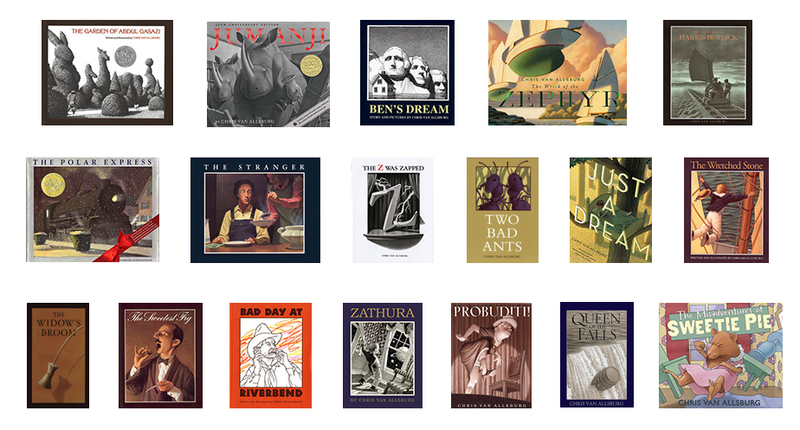 Thirty years ago a man called at Peter Wenders's office, introducting himself as Harris Burdick. Mr. Burdick explained that he had written fourteen stories and had drawn many pictures for each one. He'd brought with him just one drawing from each story, to see if Wenders liked his work. Peter Wenders was fascinated by the drawings. He told Burdick he would like to read the stories that went with them as soon as possible. The artist agreed to bring the stories the next morning. He left the fourteen drawings with Wenders. But he did not return the next day. Or the day after that. Harris Burdick was never heard from again. Over the years, Wenders tried to find out who Burdick was and what had happened to him, but he discovered nothing. To this day Harris Burdick remains a complete mystery. His disappearance is not the only mystery left behind. What were the stories that went with these drawings? There are some clues. Burdick had written a title and caption for each picture. When I told Peter Wenders how difficult it was to look at the drawings and their captions without imagining a story, he smiled and left the room. He returned with a dust-covered cardboard box. Inside were dozens of stories, all inspired by the Burdick drawings. They'd been written years ago by Wenders's children and their friends. I spent the rest of my visit reading these stories. They were remarkable, some bizarre, some funny, some downright scary. In the hope that other children will be inspired by them, the Burdick drawings are reproduced here for the first time. ​A tiny voice asked, "Is he the one?" ​Two weeks passed and it happened again. He threw with all his might, but the third stone came skipping back. Even with her mighty engines in reverse, the ocean line was pulled further and further into the canal. If there was an answer, he'd find it there. His heart was pounding. He was sure he had seen the doorknob turn. ​So it's true he thought, it's really true. ​He had warned her about the book. Now it was too late. The fifth one ended up in France. ​It all began when someone left the window open. ​She lowered the knife and it grew even brighter. He swung his lantern three times and slowly the schooner appeared. She knew it was time to send them back. The caterpillars softly wiggled in her hand, spelling out "goodbye." ​It was a perfect lift-off. Tips for writing: Who are the characters you see in the picture? Are there other characters in the story? What do you know about them? What are their names? Are they brave or timid? Clever or dull-witted? Rich or poor? Kind or cruel? Good or evil? The better you know your characters, the more real they become. As they become more real, they will bring your story to life. How did the characters end up in the situations Burdick has drawn? What happened before the scene in the picture, what will happen next, then what will happen after that? Remember, you do not need to know where your story is going to keep on writing.